"FACE LIFT FROM A CAPSULE"
RESTORE YOUR SKIN, NATURALLY : Rice cell Ceramides are the original complexion perfecters. Japanese and French studies concluded that face and body ceramides creams and lotions contribute to maintaining moisturized skin, but they tend to diminish in effectiveness with age. Rice cell Ceramides, help to re-establish the vital moisture from inside your body to increase water passage to the surface of your skin just like what happened when you were young. As you grow older your skin dries up because not enough water is getting to your skin - face and body. So you look older. When you have more water going to your face and body skin, which is what Ceramides do, you get tight young skin. As if you have had a face lift through surgery. Simple. TARGET THE CELLULAR LEVEL: Topical anti-aging treatments creams only penetrate the superficial levels of the skin. Rice Cell Ceramide capsules can more effectively assist in hydration by working from the inside out. Again note that these are not cheap PhytoCeramides made from mashed plants like Aloe Vera etc. This product is also highly acclaimed for its unmatched fast acting results due to the rice-cell derived Ceramides which effortlessly restore the suppleness and radiance of skin in a remarkably short period of time. In just under one month of usage you will be able to notice very visible improvement on the complexion of your skin. All clinical tests conducted on ceramides have been on 100 mg rice-cell ceramides extracted and concentrated from 1000MG in a 10: 1 ratio like what is in our product. These are truly effective unlike 350 mg sweet potato leaf ceramides or plant or wheat alternatives which are called PLANT PHYTOCERAMIDES which are simply like Aloe Vera and other common plant material with about 3.4mg of actual usable ceramides. There is no high tech scientific extraction process like in rice-cell Ceramides which requires high technology in laboratories to penetrateto the core of rice grains and extract the microscopic ceramides (cells) of each rice grain, which is what makes it have its face lifting, young skin restoring powers. And if you are already using Ceramide facial creams, carry on using the cream but add 21st Century's High Tech Ceramide Capsules so you get moisture injection from inside your body into the surface of your skin which will make your look soft and supple. It is also known that Ceramides inhibit Melanogenis to promote a skin lightening effect. Melanogenis is a process by which the skin produces pigments that give our skin its tone and color. This is particularly helpful for hyper-pigmentation which causes age spots and other discolorations of the skin. Ceramides exhibited a stronger whitening effect when compared to ascorbic acid, arbutin, and ellagic acids. This skincare solution’s active ingredient is formulated from 100 mg rice-cell Ceramides that have been established to be good at restoring glowing, healthy skin and young skin. That is why it is called FACE LIFT IN A BOTTLE. 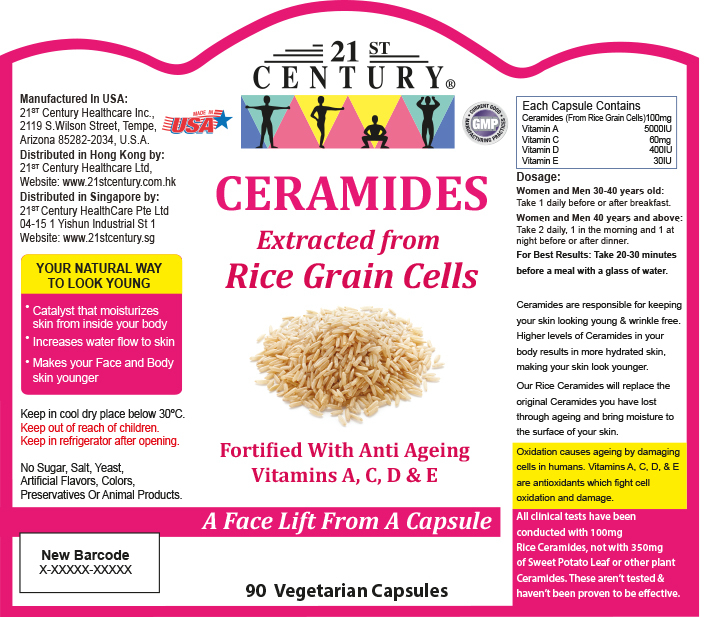 Clinical Trials and Safety Human clinical trials have been conducted on Rice Cell Ceramides. A double-blind placebocontrolled study was conducted at Osaka City University to evaluate the effects of oral administration of supplements containing rice ceramides in 33 patients with a habitual tendency toward dry, rough skin. The 33 patients were comprised of 6 men and 27 women, and the study was performed in keeping with the tenets of the Helsinki Accord, with written Informed Consent forms. This study was performed as a double-blind tial involving 6-week oral administration of “functional supplements” containing rice-derived Ceramides or a placebo.” The test supplement was given in the form of capsules with a daily consumption of rice-derived Ceramide, containing rice-derived sphingolipids of 1.2 mg/day. Placebo capsules were administered that were identical in appearance and smell, but containing 0 mg/day of rice-derived Ceramide and 0 mg/day of rice-derived sphingolipids. After the (i-week trial period, no subjects had dropped out and no adverse events were reported. Other evidence of the safety of ingested Ceramides is also presented in this study: Experiments have shown that after oral administration plant-based ceramides are absorbed unchanged in the small intestine or are broken down into, sphingosine and fatty acids for absorption and are then reconfigured as ceramides. The substance is then transported by the capillaries into the horny layer and the keratin intercellular spaces. THAT IS HOW IT WORKS TO MAKE YOUR SKIN TIGHT LIKE A FACE LIFT.